Applied Mechanical Technology is an industry leader in industrial wastewater treatment components and systems. Since 1997 we’ve been designing and building industrial equipment and systems for variety of industries. These are the core of our complete systems packages. We complete our systems with strategic OEM relationships for all the other necessary components such as instruments, pumps, valves etc. As we design and manufacture our core equipment and systems in our own shop we have the flexibility and the ability to configure our systems as needed to meet the most stringent project specifications while exceeding customer’s expectations. DAF or Dissolved Air Flotation is a simple but ingenious concept. Make tiny bubbles by dissolving gas (air typically) into water under pressure according to Henrys Law of gas whereby the pressure applied to gas will dissolve it into liquid (water). A can of soda demonstrates this nicely in a batch format. When you pop the top on a can of soda you are releasing the pressure and the gas (CO2) is allowed to come out of solution and form the foam we are used to seeing. Now imagine of that can of soda had suspended solids, they would be drawn into the foam, out of the soda, and floating on top. Not very appealing in a can of soda. A properly designed DAF does this on a continuous basis by taking a treated stream from the effluent section, pressurizing it, providing air/water interface (in a pressure vessel at 50% full of water) and promoting the dissolving of gas into the water. The SRS or Saturated Recycle System is what accomplishes this task. The SRS recycle water is then co-mingled with raw wastewater inlet and pressure is released to promote bubble formation (remember the soda can). As the bubbles form they attach to the wastewater particulate (solids, oils) and float them to the surface. This is also known as “enhanced gravity separation”. The floated material or “scum” are scraped from the surface up a beach and into a scum chamber for pumping to waste storage and further processing such as a filter press. Any solids that resist flotation and sink are collected in the bottom sludge chamber for blowdown. Optional bottom sludge augers are available for excessive bottom solids. As you would imagine, there are several variations on the overall theme including using nitrogen as the gas instead of air with highly flammable liquids are being removed from the water. We have eleven standard DAF models in sizes ranging from 15 ft2 to 250 ft2 providing 5 to 500 gpm flow rates. Higher flow rates possible with multiple units. Custom size units also available. 1). The standard DAF-SRS System is designed with a SRS Saturated Recycle System using a traditional dissolving vessel with level controls to maintain the air/water interface necessary for efficient dissolving gas (air) into water. 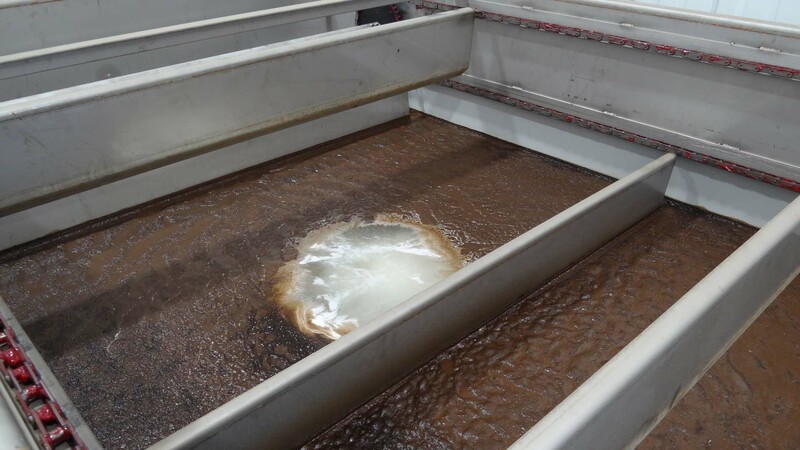 The saturated recycle is then introduced to the DAF inlet where the bubbles form and attach to raw wastewater particulate as they enter the DAF chamber for flotation and separation. 2). The DAF-I-SRS or Induction Saturated Recycle System. This system uses specially designed pumps that function in cavitation mode by inducing metered air on the pump inlet. The pump then pressurizes the gas bubbles to dissolve them into the recycle. The recycle is then introduced into the DAF inlet just as the standard system above. Whatever system you need – we can make it. Tankwash and Railcar washing. Chemical and Food Grade applications. Industrial laundries. Shop towel and traffic mats, and table cloth and linens. Heavy duty construction with 100% full seal welds. Mild or Stainless steel materials of construction. Heavy duty top surface skimmer systems made from stainless steel. Steep sloped bottoms for settlable fractions with multiple bottom sludge outlets. Optional bottom sludge augers –similar to the auger we use in our inclined plate clarifier. Fully adjustable stainless steel effluent weir. Fully adjustable operating water depth and top scum beach depth setting. Integral top scum chamber with level sensor fittings. We recommend our bubbler level sensor. XP Explosion proof electrical components. Nitrogen gas compatible (for SRS system) when explosive or highly flammable liquids are involved. Pump skids, inlet, effluent, scum, sludge. Special coatings for highly corrosive application. Click here for our Application Questionnaire to obtain a quote. We use only the highest quality materials, pumps, instruments, valves and controls components to ensure you the heavy duty robust performance you demand in today’s highly competitive market environment. All our systems are built to the highest standards of craftsmanship and are extensively tested throughout the fabrication process. We perform a variety of NDE testing including PQR, UT, XT, full hydro, dye penetrant, ASME pressure testing and of course visual inspections and functional testing both in-shop and in the field. We design and build all our own controls in-house to UL-508A Industrial Control Panel standards with strict conformance to NEC ANSI/NFPA 70 regulations. All panels are built to UL standards and are individually UL certified if required. Our operator controls interface scheme is the most advanced in the wastewater industry. We offer basic simplified controls to full featured controls systems that use SQL database platforms permitting the generation, archiving and managed all trending and effluent data. Our most advanced controls offer operator input of bench treatability testing that then allow the system . 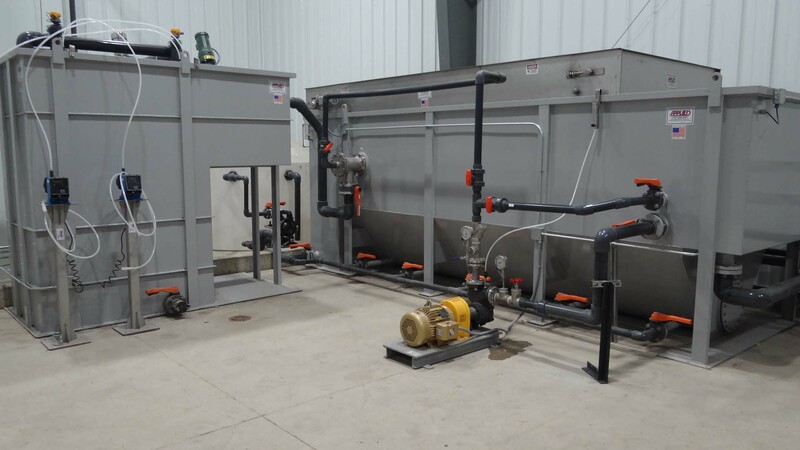 Our Industrial Tankwash Division designs and builds Railcar and Tank Trailer Internal wash systems to wash everything from Crude oil to Edible oils, from Chemicals to Corn Starch and everything in between. When you wash an industrial tank, you create an industrial wastewater and we take care of that too.